Two weeks ago, we announced the addition of over 150 GRE video lessons to our product. Well, we’ve been busy since then. So here’s some more great news. We’ve just completed video explanations for all 100 questions in ETS’s Paper-based Practice Test for the revised GRE. And we are giving them away for free! 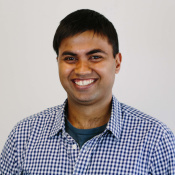 What is the the Paper-based Practice Test for the revised GRE and how can I get it? 1. The Official Guide to the GRE revised General Test: A book that you can buy on Amazon or from a book store. 2. 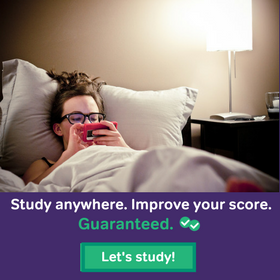 Powerprep II: Free downloadable software that mimics the computer-based GRE. 3. Paper-based Practice Test for the Revised GRE: A PDF that you can download for free from the ETS website that mimics the paper GRE test. For more on the overlap between/among these sources of official material, click here. 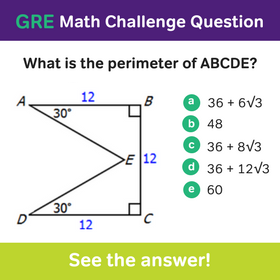 You can download the Paper-based Practice Test for the Revised GRE here: http://www.ets.org/s/gre/pdf/practice_book_GRE_pb_revised_general_test.pdf. Note that the cover is an orange-ish brown color and says “GRE revised General Test”. The old GRE practice test had a blue cover. The questions in the Practice Test have a significant overlap with the Powerprep II questions. So if you plan on taking Powerprep II in the near future or have a sticky memory, you may not want to answer the questions in the Practice Test as that may inflate your Powerprep II score. 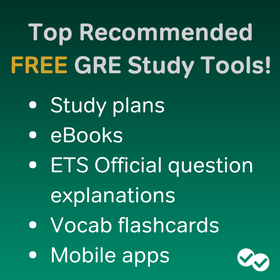 How can I access the free GRE videos? Because the questions are official ETS questions, we cannot replicate the questions in the video. So it’s important that you have the PDF of the Practice Test on hand while viewing the explanation videos. Anything else I should know about official GRE material? One note of caution about ETS resources – while they are the best source of practice (because they are the only sources of official questions), they do not provide the best instruction on GRE strategies and explanations. In fact, Chris Lele, the primary GRE expert at Magoosh, did complete review of the Revised GRE Official Guide illustrating this point. You should supplement the official practice questions with other material. I hope you enjoy the free videos. And, as always, share your thoughts in the comment section below. It’s hard to say when EXACTLY you should starting preparing for the GRE or take the exam itself. I recommend checking out this article to help you determine how long you should study for the exam 🙂 After that, because of the fact that different schools and programs have varying application deadlines, I’d recommend researching the programs you’re interested in to see when their deadlines are. Thank you Magoosh!! Just knowing the answer is not enough to improve. No problem! And we completely agree with you – you need good explanations to really improve.